In January of 2011 the four of us Albert,Carol,Marion and Bert made the choice for our annual winter get away, And our choice was the Riu Bachata in Puerto Plata Dominican Republic. Normaly would leave at 6.20am but this was the first time we left at 5.40 pm,therefor we arrived at about 10.30-11pm at the Riu Bachata. The check-in went smooth and fast, there was a small buffet in the lobby with french fries hamburgers and hotdogs, But Albert and i had to get a drink first, You have to set your priorities right at the start and Carol was so kind to get us one, After a few drinks in the lobby and getting our ID bracelet we got a porter and went to our rooms,we already knew that we were not in the same building Albert and Carol where in room 306 and we in 1207 but Marion and Carol arranged to change our room to 303. The next morning we had breakfast and then moved our suitcases to room 303 second last building on the east side of the resort. There was a nice little shopping street between the Bachata and the Merengque where they had very friendly but not pushy vendors, there was a internet cafe, a poolhall, the pharmacy,the doktor's office and plenty of shop's the only thing missing was a bar. At night there was the caribean entertainment a group they have at any other resort. They are always very friendly and talented,In addition they had a profesional dance group performing a few times during our stay,The early kids show is always a lot of fun to watch. The serving staff was awesome and always super friendly and helpfull ,Here are some of the pictures of the breakfast,lunch and dinner serving staff. 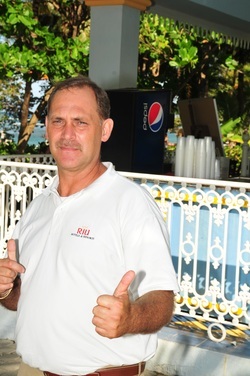 Then there was Mr friedrich the service manager,I was truly impressed by the way he took care of the guest at the Riu Bachata.He would walk arround several times a day not only during lunch an dinner but all day talking to guest and dealing with their problems and helping out those in need. To some it all up we had a wonderfull time at the Riu Bachata, The weather in the first week wasn't the greatest but nobody can control mother nature,The travel agency's (sunquest,sunwing,nolitours,airtransat etc etc) rate the Riu Bachata as a 5 star and so does the Riu chain itself, this is not true , At best i would rate this resort a 4 star rating,and this is being nice 3 1/2 star rating is fair.But in all honesty for what we payed for our 2 week stay ($3000.00)for the 2 of us we had a great deal , Arrival and departure tax where incl and so was the roomsafe.The little problems we had where dealt with asap. The food was very edible, the alla-carte restaurants where satisfactory and 4 star for sure. I will be adding pictures over the next few days and more comments feel free to contact me using the form below.